As just about everyone in town knows, today’s the Red Sox Home Opener/World’s Serious Shindig. 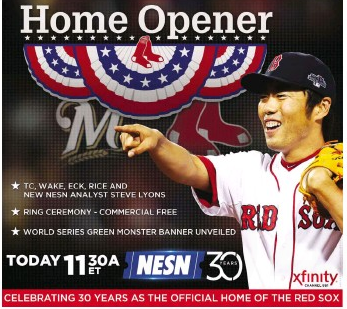 But just in case anyone doesn’t know, NESN ran this ad in the Boston Globe Sports section. Got that? 11:30, Ring Ceremony commercial-free, and etc. Know what else was NESN ad-free? That’s right – The Herald. That ad was nowhere to be found in today’s edition of the flunky local tabloid. For the Heraldniks, apparently, NESN stands for Not Even Second Now. This entry was posted on Friday, April 4th, 2014 at 2:26 pm and is filed under Uncategorized. You can follow any responses to this entry through the RSS 2.0 feed. You can leave a response, or trackback from your own site.